Please note that a 3% payment processing fee will be added to any fees or payments paid online via our website. This fee is required. 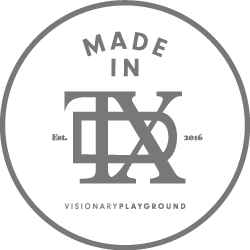 Please make checks payable to Visionary Playground. Refunds may be applicable for things such as over-payments or charge errors, towards a particular project. Note this can vary per project. Restrictions may apply. For flat-fee based projects: At Visionary Playground we consider every project with the final deliverables in mind, and therefore do not offer refunds for projects that have been started or for projects that have been agreed upon within the Services Agreement. Once the agency has commitment from a client, our team immediately begins on the scope of work, therefore it is non-refundable. If a project is cancelled or abandoned, the client remains responsible for any outstanding payments which are due to Visionary Playground. For hourly-based projects: If there is a change to a project after the initial scope of work has begun or finalized, we can apply an amount of unused pre-paid time towards future work, if applicable. Note if additional time is required, additional charges may apply. However, please note costs may increase due to initial project rates that may have been discounted for whatever reason, we may not be able to give full credit for specific items within a proposal. If a project is cancelled or abandoned, the client remains responsible for any outstanding payments which are due to Visionary Playground.